1. Press Pause to find the lessons (Mind map this out and ask me for help if you have no idea what I’m taking about!). Practice massive self-care with nourishing foods, sleep, let the negative emotions happen, they are necessary and it’s okay to not be okay, then find a smile. Whatever this will help & don’t be afraid to ask for support too. 2. Stop trying & practice patience. Trying to get it all right, to fix it quickly doesn’t always work. Some things take time, so let go of try and frustration, instead practice patience with purpose. 3. Be mindful of your story. Once you have done 1 & 2, think about how you want to share the struggle so you can rise above it with courage, rather than become stuck with the limits and ‘why me’… embrace what you can control, let go of why you can’t. 4. Find a different door of opportunity to open. Often the struggle causes us to get stuck and miss the great opportunities which are just beside us, yet we don’t find them. Explore then, you never know who you may meet, what or where you might go, be brave, watch my ‘Embracing Adversity‘ ted talk for more tips too. Yesterday I was hit hard in my car (no ‘I’m sorry’ needed but any psychic insights or new car recommendations welcome!) and they whizzed off. It’s the third time my car has been hit without any contacts, and the 4th time I’ve been hit hard if you include the bike! My reflection (after natural emotions etc) is to follow my process above, nourish my wealth (as it’s costing), to learn, find the lessons/insights, to feel grateful @thehoundofhappiness wasn’t in the car, that I met 3 lovely people who helped me & that ultimately I am 100% okay. 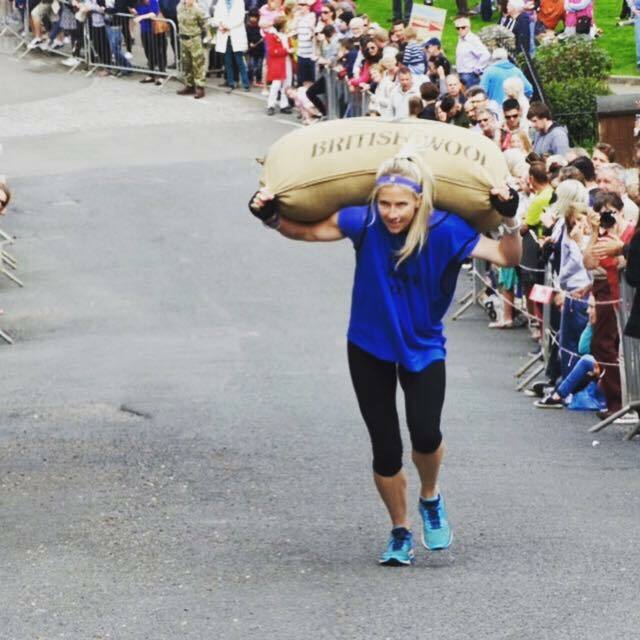 This photo is @royaloaktetbury World Wool Sack Champs!! It kind of seemed a great image…. you have a choice. You can either carry the weight of your problems, or you can rise up, realise your inner strength, grow and see what’s possible at the top…..
Hope this helps YOU, feel free to get in touch. Click here for 1-1 coaching and here for Keynote Speaking.